Even dogs who feel that a bath is cruel and unusual punishment have to get one once in a while. While some dogs with short coats can get away with just water, most dogs need shampoo. Why do dogs need their own kind of shampoo? Manufacturers say their products are gentle enough to prevent the natural oils in a dog’s coat from being stripped, but strong enough to get out the dirt. No more tears: Just as we have baby shampoos, there are very gentle puppy shampoos available. Brightening/whitening: These are made for dogs who are supposed to be sparkling white after a bath, as opposed to the beige mess they are beforehand. Waterless or rinse-free: Using a dry shampoo, or powder, will minimally clean up the dirt, but is intended only for quick fixes. Your dog won’t get really clean, and a few days later the coat can feel even dirtier or stickier than before you used it. Stamping out skunk: Technically this isn’t shampoo, but it’s more effective than deodorizing shampoo or that useless tomato-based mixture. Mix 1 quart of 3 percent hydrogen peroxide, 1/4 cup of baking soda, and 1 teaspoon of liquid soap. Mix and apply immediately, then rinse thoroughly. Medicated shampoos can help you deal with certain problems–like helping keep away fleas, ease itching, and heal mange. It’s much harder to use, though, for the simple fact that in order to be at all effective it has to remain on your dog for 10 minutes before rinsing. 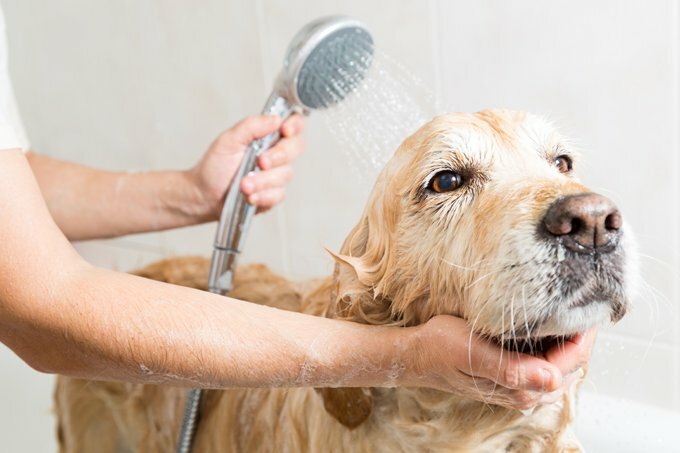 That’s 10 solid minutes on a soaking wet, icky-smelling, annoyed canine who thinks 30 seconds is a long time–so cover the bathroom floor with plenty of towels before you begin the process. Flea and tick: These shampoos help keep the parasites at bay. Some are also effective against lice. Hypoallergenic: For dogs with allergies or who are sensitive to fragrances or other ingredients in regular shampoos, these are the ones to look for. Anti-itch: These shampoos contain anti-itch and anti-inflammatory properties, such as hydrocortisone or lidocaine. These can be purchased over the counter. Prescription: For some conditions, such as mange, your veterinarian may prescribe medicated shampoo as part of the treatment.